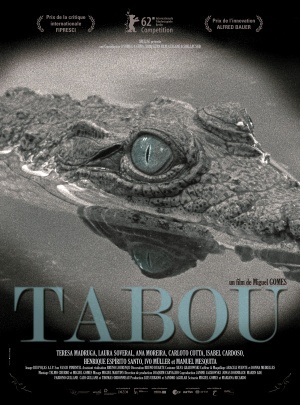 There is a strong romantic streak melded with a sense of the fantastic as part of the everyday that runs through Miguel Gomes' TABU. The film is then covered in a deliberate sheen of artifice and tempered with enough warm humanism to ensure it never feels too stuffy or pretentious. It begins with a prologue set at some unspecified time in the past in which a Portuguese explorer braves the perils of “darkest” Africa. He has ostensibly been sent there as an agent of Church and State. In reality, the explorer's true motivation is grief over a lost love, and rather than carry out his official mission he instead commits suicide by crocodile. His act becomes part of the local legends and lore, with many claiming to see a beautiful woman by the river accompanied by a crocodile. The film then flashes forward to the present day just after Christmas where we meet the elderly gambling addict Aurora (Laura Soveral), her black caretaker Santa (Isabel Muñoz Cardoso), and Pilar (Teresa Madruga), a well intentioned busy-body neighbor who worries that Aurora needs more help than Santa can provide. Pilar's feelings turn out to be warranted when Aurora suddenly falls ill as the New Year dawns. Aurora isn't given long to live, and she asks Pilar to find a man named Ventura (Henrique Espírito) and bring him to her side. This eventually leads to a flashback to Aurora's younger days (where she is played by Ana Moreira), in which we see her and the young Ventura (Carloto Cotta) engage in a forbidden love affair, and the ramifications thereof. The entire film is shot in gorgeous black and white, with the scenes set in the past done silent with narration, although there is no attempt, as in THE ARTIST, to faithfully replicate silent film techniques. The feeling one gets while watching TABU is of hearing a fairy tale or fable for adults. Like all fairy tales, this one is rife with symbolism and iconic figures, with the most obvious and persistent being the crocodile who acts as some sort of avatar of tragic romances. Some critics, such as A.O. Scott, have taken the film to task for not taking some kind of stance against the colonialism it depicts in its flashback sequences. While Scott's critique is not without merit, the film does at least touch on these issues, albeit in a subtle and poetic way in keeping with the overall tone. Had the film taken a more overtly political approach it would be very different. Not necessarily bad, but certainly lacking the magic TABU possesses in the form it presently exists. 3 1/2 out of 4 stars.